The world is going Agile, are you? SCRUMstudy's widely accepted certifications help individuals and organizations complete projects faster and more successfully. 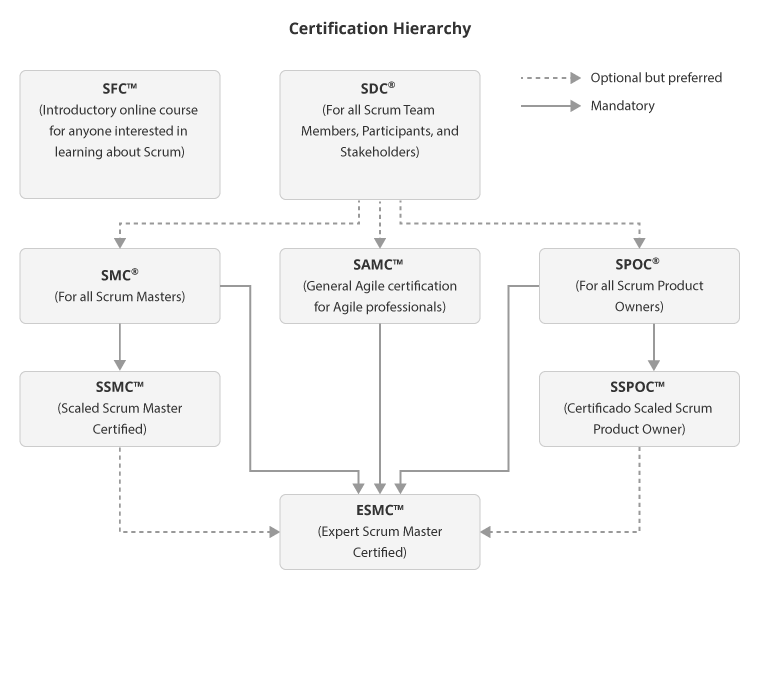 Though there is no mandatory prerequisite for most of the SCRUMstudy certifications, it may help to follow the preferred hierarchical structure. The Scrum Fundamentals Certified (SFC™) course is tailored to help anyone interested in learning the basics of Scrum. This course is included as a part of a Primary lifetime membership. The purpose of the Scrum Fundamentals Certified (SFC™)' certification exam is to confirm participants have a fundamental understanding of the Scrum methodology. Scrum Developer Certified (SDC™) is an entry level certification. The objective of this certification is to ensure that participants understand the basics of Scrum which Scrum team members need to know to effectively contribute to a Scrum project. Scrum Master Certified (SMC™) professionals have a practical, working knowledge of Scrum that equips them to guide and implement Scrum projects in a Scrum environment. The purpose of the exam is to confirm that applicants have achieved sufficient understanding of how the apply Scrum framework and practices to projects and to tailor Scrum in a particular scenario. SCRUMstudy Agile Master Certified (SAMC™) professionals possess a wide range of knowledge and understanding of the values, methods and intricacies of Agile methodologies, including Scrum. The purpose of the exam is to confirm participants have the ability to compare and choose the appropriate methodology in a given situation. The Scrum Product Owner Certified (SPOC™) certification exam is designed to confirm a Product Owner's applicants practical and working knowledge of Scrum in terms of the ability to handle the related business aspects and projects stakeholders (particularly the customer) in a Scrum environment. Scaled Scrum Master Certified (SSMC™) Large projects require multiple Scrum Teams to work in parallel. The Chief Scrum Master is responsible for coordinating activities of multiple Scrum Teams to develop potentially shippable product increments/deliverables. The Chief Scrum Master fosters collaboration and coaches others with the implementation of Scrum for a smooth delivery of the project’s products. Apart from clearing impediments and ensuring a conducive project environment for the Scrum Teams, the Chief Scrum Master collaborates with the Chief Product Owner, other Scrum Masters, and Product Owners in activities such as developing the list of components and resources needed in common for all teams throughout the project. The Chief Product Owner makes the day-to-day business decisions in the case of large projects with numerous Scrum Teams and multiple Product Owners. The Chief Product Owner prepares and maintains the overall Prioritized Product Backlog for the large project, using it to coordinate work through the Product Owners of the Scrum Teams. The Chief Product Owner will be responsible for the final deliverable of the project. Apart from making final business decisions, the Chief Product Owner collaborates with the Chief Scrum Master, other Product Owners, and Scrum Masters to develop a list of components and resources needed in common for all the teams throughout the project. The Expert Scrum Master Certified (ESMC™) certification is the next step for Scrum practitioners to further demonstrate their expertise in the Scrum methodology.